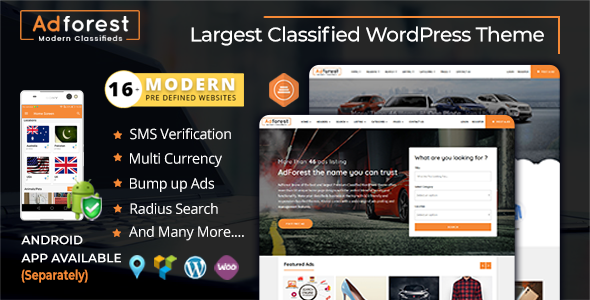 AdForest : version 4.0 – A WordPress Classified Ads Theme is powered by visual composer, the powerful visual builder witch stands at the core of WordPress AdForest theme. The simplicity with who you will build or edit page will blow you way. Finish your project much more faster with AdForest theme download. AdForest is a Classified Ads theme that gives users flexibility to build website layout and design for their business. The AdForest theme comes with powerful page builder and a lot more options. 38+ Shortcodes in AdForest theme to easily personlize your wordpress site to your liking. Highly customizable you can comfortably adjust the sites to meet your requirements. All the tools you might need are included in a single theme. Very Good theme for classified ads business. Best choice for any startup.